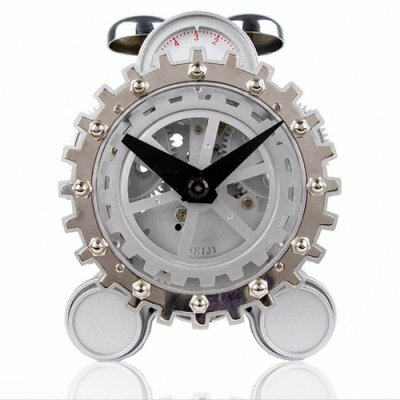 Successfully Added Gear Alarm Clock - Retro Inspired Design to your Shopping Cart. Completely retro and completely cool gear operated alarm clock. This is THE night table accessory to have if you like to have original designed gadgets in your room. With both a 12 hour analog style clock as well as a 12 hour alarm with an old fashioned 2 bell striker for waking you up, this is a easily operated but timelessly designed time piece sure to be the center of attention. With absolutely no MOQ, order a sample for yourself to see the cool quality of this retro alarm clock, then order in bulk for even bigger savings of this highly resalable item..